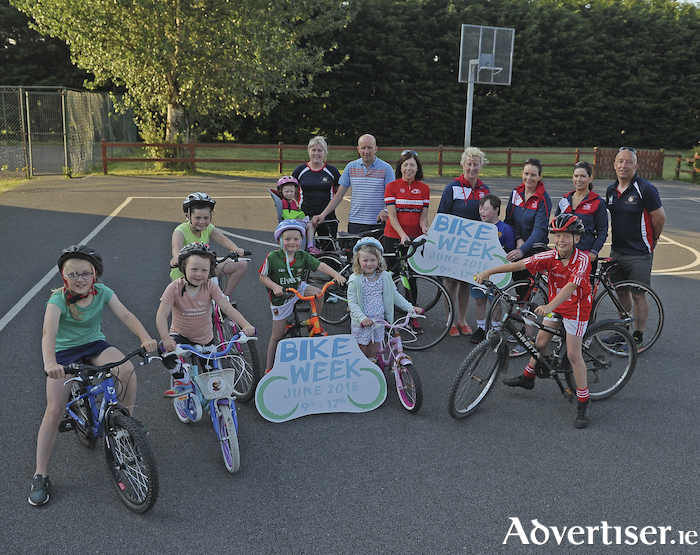 On your bike: Members and friends of Ballintubber Cycling Club pictured at Ballintubber National School with Mayo Sports Partnership representatives ahead of the National Bike Week event that the club will host next week. Photo: Conor McKeown. National Bike Week returns to Mayo this summer from Saturday June 9, to Sunday June 17, where you can enjoy eight days on two wheels celebrating and promoting all that is great about cycling. Mayo Sports Partnership in conjunction with the local Bike Week Steering Committee invites you to ‘Get on Your Bike’ and participate in some of the 25 events taking place throughout Mayo. Events include family cycles in Achill, Ballinrobe, Ballycastle, Castlebar, Kilmovee, Cornboy, Islandeady, Partry and Swinford. There will be school/public cycles in five locations across the county, a Sofa2Saddle beginner cycling programme in Ballina, Ballinrobe, Westport and for Mayo County Council staff a ‘Tea to Turlough Cycle’ on Wednesday June, 13 at 4pm. Other novel events include a Bike Rodeo Games and Parade in Lecanvey on Saturday June 16, at 2.30pm; the Ballintubber Cycling Club 5km Moorehall Mountain Bike Trail Cycle – through Moorehall woods on Satuday, June 16 at 3pm and the Covey Wheelers Westport Night Time Leisure Cycle on the Great Western Greenway at 9pm on Wednesday, June 13. All of the events are organised locally by community groups / clubs and are co-ordinated by Mayo Sports Partnership Bike Week Steering Committee members including Mayo County Council Road Safety and Smarter Travel Offices, An Taisce Green Schools, community councils and cycling groups throughout Mayo. For a full list of events see programme on this page and to join in a cycling adventure this June, log onto www.bikeweek.ieor www.mayosports.ie/news. Men’s Health Week also takes place from Saturday June 9, to Saturday June 16. Mayo Sports Partnership have been to the forefront in promoting men’s involvement in physical activity through the very successful Men on the Move initiative. However, with most Men on the Move groups in Mayo on a summer break Mayo Sports Partnership Co-ordinator Charlie Lambert emphasised there is plenty of opportunities for men to take part saying: “We would like to make a special appeal for men to get involved through the 25 events taking place during Bike Week along with 15 Community Walking Groups active now in the county. Cycling and walking are two great activities to take part in. “The benefits to be gained from cycling are immense. They include improved health, reduced traffic congestion, better air quality, improved accessibility to transport and reduced costs. Page generated in 0.1364 seconds.